Although fans and the media will likely talk about the starting line kerfuffle between Lucas Oil Racing TV pro rider Hector Arana Jr. and semifinal foe LE Tonglet, the composed 28-year-old will maintain his laser focus on what matters the most — winning the 2017 Mello Yello Pro Stock Motorcycle championship. After comfortably dispatching Charlie Sullivan (6.889 to 7.044) and Karen Stoffer (6.922 to 6.993) in the first two rounds of elimination action at Sunday’s 33rd annual Dodge NHRA Nationals, Arana, and more specifically his father and crew, felt they had to fend off some unsportsmanlike conduct from Tonglet’s team owner, reigning champ Jerry Savoie, and his team. But Arana shrugged it all off and remained on task. As for the shenanigans on the starting line versus Tonglet, Arana was quick to point out he did nothing wrong or illegal. In fact, it was Tonglet who provoked the squabble by “double-bulbing” Arana, a legal but controversial tactic usually employed by lesser opponents trying to upset a much better rider. “I was just inching up to the tree, about to roll into the pre-stage beam, and for whatever reason he double bulbed me,” Arana said. “I decided to sit there and compose myself before I advanced any further forward. It was nothing. The final numbers had Tonglet winning with a beatable 6.945 at 194.44 mph to Arana’s 7.104 at 183.54 mph. 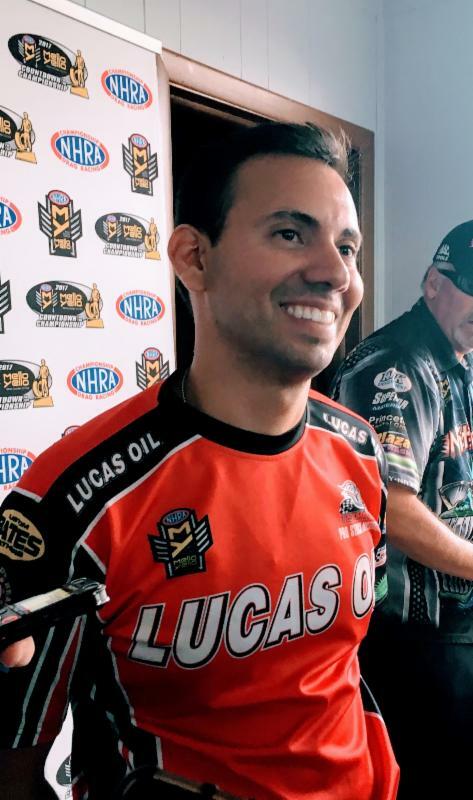 The Pro Stock Motorcycle class next assembles in five days at the sixth annual AAA Insurance NHRA Midwest Nationals at Gateway International Raceway, the third of six races in this year’s Countdown to the Championship playoffs.